Springtime is one of the busiest times of the year for families: dance recitals, baseball, soccer, lacrosse, tennis, swimming, end of the school year banquets and awards ceremonies. I’m booked every night of the week in May with just one child, and it’s easy to let manners slide when you’re eating take-out or re-heated food for spouses or kids who’ve missed the normal dinner time each night. With Mothers’ Day brunches, graduation open houses, Fathers’ Day cookouts and wedding season approaching, it’s a great time for kids to take a refresher on manners and etiquette in a variety of social situations. 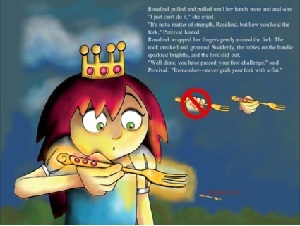 This app introduces Rosalind, a rude princess who has a rude pet dragon named Sparkler. Appalled by their behavior, the queen banishes them both from the castle until they find good manners. Clever animation makes this app entertaining, and includes true and false facts to reinforce learning good manners. 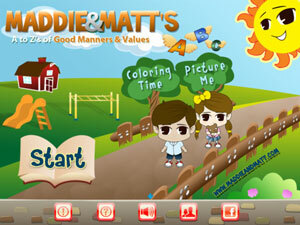 This app lets two cartoon characters, Maddie and Matt help your kids learn respect, politeness, courtesy, and gratitude with an “A to Z's of Good Manners & Values.” Specific scenarios teach kids the importance of social graces by showing Maddie and Matt exhibiting good manners and values. While not as highly rated as the others, this app covers a variety of different manners (table manners, sharing, being a good guest, not interrupting, etc) that where you need to guess how “Johnny” the character in the app should behave in the proper way. Kids are shown multiple options on how to behave and they then need to pick the correct behavior.